This page gives an overview of nanoDSF method. You can find information on the core technology and typical applications of nanoDSF. Also, detailed information on data interpretation and the central advantages of the method are given. For nanoDSF Services, please follow the links to the right. NanoDSF stands for the nano-format of Differential Scanning Fluorimetry (DSF). It is a fast, robust, high-quality, and – most importantly – label-free and in-solution method for the analysis of protein stability, thermal protein unfolding and melting temperature analysis. Consequently, nanoDSF is a great tool for buffer and formulation screening as well as screening of small molecule compound libraries for influence on protein stability and shifts of thermal melting temperature. Additionally, nanoDSF allows for analyzing the colloidal stability of protein solutions (aggregation). In general, the intrinsic tryptophan fluorescence of proteins is strongly dependent on their 3D-structure and hence the local surroundings of the tryptophan residues. Using chemical denaturants or a thermal gradient, proteins can be unfolded, which leads to changes in their intrinsic tryptophan fluorescence. This translates into fluorescence emission peak shifts and intensity changes. NanoDSF monitors these fluorescence changes with high time-resolution and can reveal even multiple unfolding transitions. NanoDSF is therefore highly successful in antibody engineering, membrane protein characterization, protein quality control, buffer screening, protein unfolding analysis, and small molecule compound binding screening. The figure above illustrates the principle behind thermal protein unfolding: Increasing temperature causes unfolding of the three-dimensional protein structure and thus tryptophan residues to become solvent exposed. NanoDSF monitors the concurrent changes in tryptophan fluorenscence at 330 and 350 nm wavelength. In order to detect protein aggregation, the special Prometheus NT.48 nanoDSF device available at 2bind features also back-reflection optics. Normally, visible light passes through the capillaries containing the protein sample of interest without any interference, is reflected by a mirror on the capillary tray, and finally quantified by the detector. If the protein sample contains aggregated particles, the incident light is scattered by these particles. The loss of reflection intensity is a precise measure for protein aggregation. NanoDSF is a differential scanning fluorimetry method able to analyze the conformational stability and colloidal stability (aggregation behavior) of proteins under different thermal and chemical conditions. The conformational stability of a protein is described by its unfolding transition midpoint Tm (°C), which is the point where half of the protein is unfolded. The truly label-free nanoDSF technique monitors the intrinsic tryptophan fluorescence of proteins, which is highly sensitive for the close surroundings of the tryptophan residues and which changes upon thermal unfolding. Up to 48 capillaries are filled with 10 µl of protein sample and simultaneously scanned at 330/350 nm wavelengths. Melting temperatures are recorded by monitoring changes in the intrinsic tryptophan fluorescence and aggregation onset temperatures are detected via back-reflection light scattering. The samples can be heated to any temperature in the range from 25°C to 95°C. Importantly, samples can be studied without the use of a dye and with free choice of buffer and detergent. Melting temperatures of proteins with a concentration between 5 µg/ml and 250 mg/ml can be analyzed. In order to obtain high quality aggregation onset temperatures, protein solutions with concentrations above 1 mg/ml are required. The interpretation of nanoDSF data can range from easy and straightforward to relatively complex, because the change in fluorescence if often a complex mixture of changes in fluorescence intensity at different wavelengthts as well as shifts of the underlying fluorescence spectra of the denatured protein in relation to the native state. To make life easier, below is a guid of the most common cases of nanoDSF data analysis and interpretation. First, let us consider a case where the denaturated state shows a fluorescence spectrum that is red-shifted (dotted lines) in relation to the spectrum of the native state (solid line). A red-shift is the most common result of protein denaturation, because the tryptophan residues, which are usually packed inside the hydrophobic core of the protein are now exposed to the hydrophilic solvent environment. This leds to a change of their fluorescence properties towards higher wavelenghts. Please note that the Prometheus NT.48 nanoDSF device does not measure full fluorescence spectra, but only monitors at the two distinct wavelenghts 330 nm and 350 nm. The depicted spectra are only for visualization. In the case of a red-shift upon protein unfolding, the fluorescence signal at 350 nm does not change too much; consequently the fluorescence intensity progression in the single-wavelength graph is rather linear. However, at 330 nm the fluorescence intensity changes quite drastically due to the red-shift; consequently, the fluorescence intensity decreases with increasing temperature. The division of the 350 nm signal by the 330 nm signal now leads to an inversion of the curve progression, because “no change” at 350 nm is divided by “decrease” at 330 nm, resulting in an increase of the ratio signal. Finally, the mathemal operation of 1st derivate transforms the ratio curve into a classical peak shape. The maximum of the peak corresponds to the melting temperature of the protein (inflection point of the underlying ratio curve). Second, let us consider a case in which the denaturation of the protein leads to a blueshift. This can either be the case for a surface exposed tryptophan, which gets surrounded by hydrophobic residues in denatured “clumps” of protein. Alternatively, a blueshift is sometimes observed for interior tyrosine residues. In the case of a blue-shift upon protein unfolding, the fluorescence signal does not change that much at 330 nm and changes more strongly at 350 nm. Consequently the fluorescence intensity curves look exactly opposite to the red-shift case: Now, there is not much change in the fluorescence intensity progression of the 350 nm signal, but a pronounced decrease of the 330 nm fluorescence intensity signal. The division of the 350 nm signal by the 330 nm signal results in a similarily oriented ratio curve, because a “decrease” at 350 nm is divided by “no change” at 330 nm. Finally, the mathemal operation of 1st derivate transforms the ratio curve into a classical peak shape. The maximum of the peak corresponds to the melting temperature of the protein (inflection point of the underlying ratio curve). Due to the decrease of the ratio curve, the peak is now inverted and facing downwards. Third, and last, let us consider a case where there is neither a red-shift nor a blue-shift upon protein unfolding (or both effects cancel each other out). In such a case, only the overall fluorescence intensity decreases for both the 330 nm and the 350 nm channels. This translates into decreases in both fluorescence intensity curves in the single wavelength graph. Because there is now a decrease in both wavelenghts, the division of both signals leads to a rather flat ratio curve. Consequently, no meaningful 1st derivative curve can be calculated. 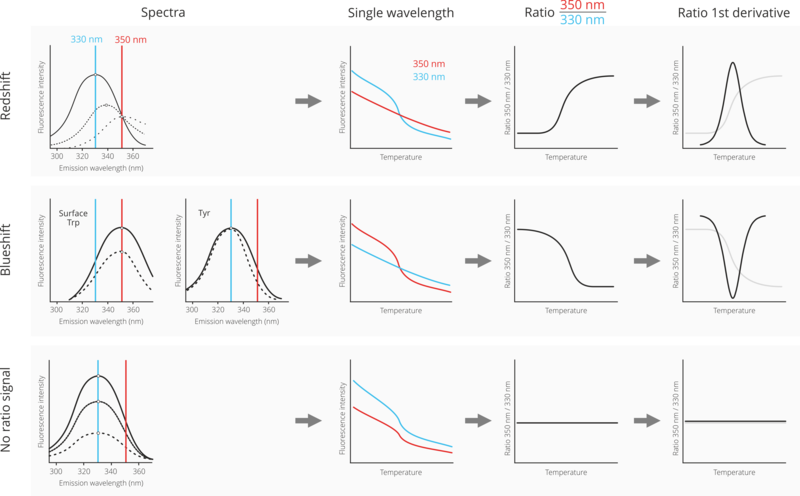 In such a case, it is best practice to analyze the single wavelength graphs instead of the ratio curve for determination of the melting temperature. For more information, take a look at our Application Database as well as our services for Drug Discovery, Antibody Development, and Protein Biophysics. NanoDSF offers a great number of advantages over traditional fluorimetry approaches. Most importantly, in constrast to standard Differential Scanning Fluorimetry, nanoDSF does not require the used of fluorescent dyes like Sypro Orange. What are typical applications for the nanoDSF Technology? Is screening possible? NanoDSF is very robust and versatile, because it is a true in-solution, label-free method for analyzing protein stability and protein unfolding. The broad analyzable protein concentration range allows for investigating biopharmaceuticals at very high concentrations, as they are for example used in formulation development. Furthermore the nanoDSF technology is especially suited for applications in antibody engineering since the ultra-high resolution allows to detect and to analyze multiple unfolding transitions and unfolding events. NanoDSF also provides the possibility to measure the stability of membrane proteins in detergents since this method is truly label-free and does not require any fluorescent dye. Moreover, due to the fast analysis pace and high throughput, nanoDSF is well suited for screening of buffers, buffer additives or small molecule influence on protein stability and protein unfolding. How many tryptophans are needed for detection? One tryptophan per protein is typically sufficient for a measurement due to the high sensitivity of the nanoDSF detector. Also, tyrosin fluorescence can be detected and analyzed. In the latter case, at least 5-10 tyrosines should be present in your protein of interest. How many samples can be measured in parallel? Is it possible to detect wavelength shifts due to protein unfolding? Since the Prometheus NT.48 detects two different wavelengths, 330 and 350 nm, blue- and redshift of the tryptophan fluorescence can be distinguished. Are fluorescent dyes required for nanoDSF analysis? No. NanoDSF is a truly label-free method by monitoring tryptophan and tyrosin fluorescence at 330 nm and 350 nm. Another label-free method based on tryptophan fluorescence is label-free MicroScale Thermophoresis. This technique allows for measuring steady-state binding affinities of molecular interactions. How many data points can be recorded? Due to ultra-high resolution of the nanoDSF NT.48 device, 36000 data points are recorded for an experiment with 48 samples and a heating rate of 1°C/min between 20°C and 95°C. Is it possible to analyze the stability and unfolding of individual domains in a protein? The ultra-high resolution of nanoDSF allows us to detect and to analyze multiple transitions and unfolding events. NanoDSF works with ultra-thin glass capillaries. Thus, only 10 µl of sampleis required per experiment. What concentration range of my samples can be measured? In general, it is possible to analyze protein solutions from 5 µg/ml up to more than 200 mg/ml. Is it possible to analyze membrane proteins with nanoDSF? Yes. Stability of and unfolding of membrane proteins can be analyzed with nanoDSF unlike with other fluorimetry methods, because nanoDSF is truly label-free, works with detergents, and does not require any fluorescent dye which could interfere with the detergent. Are there any size limitations of my proteins? No. It is possible to analyze the stability and unfolding of protein complexes up to the Mega-Dalton (MDa) range. What is the temperature range for the measurement? The temperature range spans from 15°C to 95°C. Possible heating rates are from 0.1 to 5°C/minute. Are there any limitations in buffers or additives? No. Due to the combination of a label-free setup and the monitoring of tryptophan fluorescence, almost any buffer and any additives, including detergents, can be analyzed in the nanoDSF setup. Even measurements with autofluorescent components and biological liquids are possible to a certain extent, as long as their fluorescence does not intefere too much with tryptophan fluorescence.